Usually the young cricket is size of an ant, but they grow up to almost 1 inch. As with other Orthopterans, crickets have chewing mouthparts, long antennae, powerful hind legs for jumping and one pair of membranous hindwings with a pair of leathery forewings. They are not aquatic insects, but they have a pair of long jumping legs on the back side of their body. Many Orthopera can make sounds to attract mates, protect their body from predators, and alarm. When they want to make sounds, they just rub their legs or wings. Crickets make sound 2 different ways, first one is they use long range so that they could know the mates are near. When mates come close to other mates, they make quiet sounds. Also they can attract the mates by smell. When female and male crickets are together, male cricket just put the sperm directly to the female's body and the female cricket puts ovipositor into the wood or ground to laying the eggs during the fall season. The reasons for lay the eggs into the ground or wood is its much more safe than other places and ground's temperature does not change a lot, so that the eggs can stay safer. After a few weeks, the female cricket starts to hatch the eggs. When the mole cricket hatch the eggs, they have a unique chamber to protect the eggs from the predators. The larvae looks like an adult however their wings and reproductive organs are not developed yet. The special thing for cricket is they do not have pupa stages, but they just molt 6 times to 8 times to be an adult cricket. We often hear the sound of crickets. Depending on the species, they live in different places like Field cricket, Camel crickets and House crickets. Field crickets live in pastures and the field. They like to eat dead insects. Camel crickets live in cool areas and dark areas, because they are sensitive to light. House crickets live in pastures like field crickets. Snowy tree crickets, they produce sounds differently when the weather is warm and cool. Their sound is actually higher in warmer temperature. Mostly they live in the forest or deciduous trees. 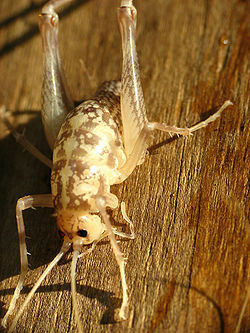 Unlike other species of crickets, snowy tree crickets just hatch the eggs during spring and nymphs just become adults in the middle of the summer. Nymphs eat a young fruit and flowers, etc and adults eat other small insects or caterpillars. 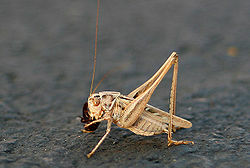 Crickets eat everything like decaying plant matters and organic food. Actually they have strong jaws to eat whatever they want to. They eat dead insects or their own, when they don't have any food around them. Most crickets start finding a mate in late summer, and lay the eggs in the fall. They hatch about 2,000 eggs per one fertilization and they keep hatching the eggs. They usually hatch the eggs twice in a month. We often hear the sound of crickets. The reason for making sound is just all about finding a mate.Only male crickets produce the sound for attracting the female crickets. When female crickets hear the male's sound, they just distinguish the sound if that sound is from same species. Also male crickets produce sounds for protecting their place and defending the female. Crickets make the sounds by their forewings, they just rub their wings each other. The strange thing is they produce sounds for different reasons. Like between the sounds for calling a mate and just chirping are really different. Diet and life cycle Gorochov, A.V. & Mostovski, M.B. 2008. Reproduction of Crickets from creationwiki. crikets eclogy Jeffrey Hahn and Mark Ascerno, 2009.
crickets chirp By Debbie Hadley, About.com Guide. This page was last modified on 29 October 2015, at 19:45.